‘Art against War’ is a themed painting exhibition created by artist John Devaraj. 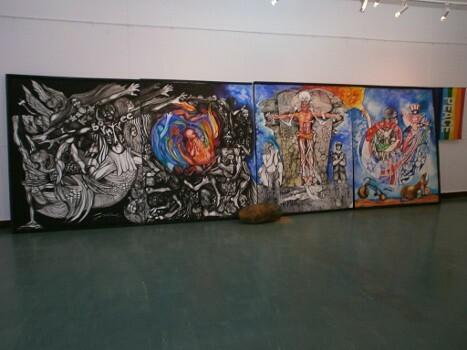 When I went to the Art gallery of the Government Museum in Bangalore recently, he had organized a display of his above shown work titled, ‘A hundred million crucifixions’. There is an important message that the artist wants to spread through his painting (and the exhibition) – Art can be used as a powerful medium to express one’s opposition to War and Child labour. The art work and the exhibits, mostly containing information on the deadly destruction caused by the Hiroshima and Nagasaki Nuclear explosions, did create an impact on the viewer. The history of mankind is the history of war? There are 30,000 nuclear missiles in the world today? Hundred and Thirty Four million children are forced into child labor in India? The two atom bombs that fell on Hiroshima and Nagasaki killed 3,50,000 people? Each nuclear bomb can cause more destruction than 2.5 Kg of Dynamite? In the past 5,000 years of human history, there have been only 147 years of peace? 40% of the land of Okinawa is occupied by the US army? Almost 50% of the national resources are spent on defense directly or indirectly? War profiteering (including all related activities) is a major business in the world? When Mahatma Gandhi and Nelson Mandela were able to practice Non-violence successfully, why not rest of the world? Powerful message, succinctly conveyed! I wish the best for all his endeavors. Wow! now that’s lots of eye-opening facts…many of which I read for the fist time. I too came across these facts for the first time. Glad to share. As their say, a picture is better than thousands of words. Nice facts but a sad reality. We have become a civilisation hell bent of destroying each other over nothing. Well, not exactly over nothing but something very close to that! The art work is beautiful! Could you upload some more of them! Coz I could not clearly see the close up of those works! And are there 134 Million children working in India! Another biggest problem that India could not solve! “When Mahatma Gandhi and Nelson Mandela were able to practice Non-violence successfully, why not rest of the world?” – Loved this statement here! I am not sure if I can display closer view of this painting (I don’t have a closer view anyway). Child labour is one reason why we get things relatively cheaper in India. But then, we don’t realize the higher price we pay for that! I will give you a example in world war hitler/germany were accused of killing millions thousands .. But did you know the there was a time when British bombarded cities in germany and killed thousands and thousands of people living in those cities almost wiping out the entire cities almost every house building was bombarded and burnt. It was not just one city but lots of them .. But no one talks of that ..
No one talks of that because the western media never reports it in any channel. But the holocaust is repeated again and again everywhere. Stalin, liquidated equal (or more) of his own people in Russia. No one reports about that either. “When Mahatma Gandhi and Nelson Mandela were able to practice Non-violence successfully, why not rest of the world?” Why not? I wish we all understood this. Love these endeavors of artist John Devaraj! Art and culture and even sports can make friends of enemies. I guess the exhibition itself was not well advertised. Since I went to the museum on that days, I happened to see this! That info about United States benefiting from World Wars might as well be true. Need to check on it. awesome post with quite an astonishing facts !